I always thought that GSC usually announces their flagship products on Friday … and it seems to be true after all, as Nendoroid Saber Extra from the famous PSP game Fate/Extra got her announcement today. 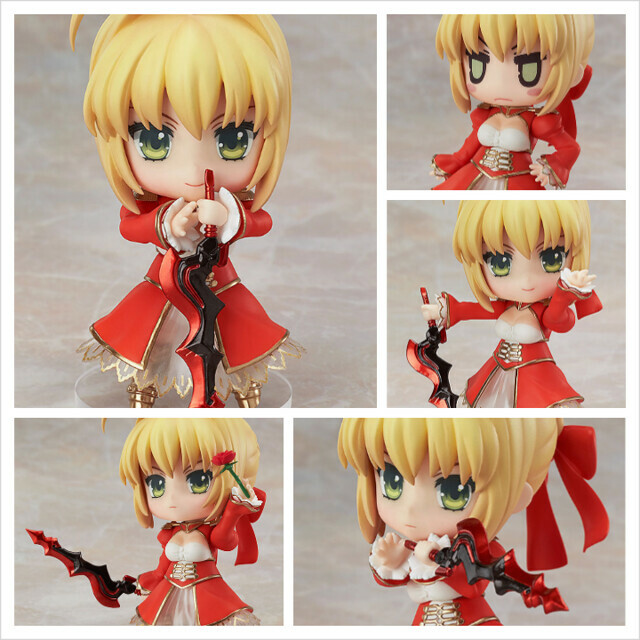 From the popular game ‘Fate/EXTRA’ comes a Nendoroid of Saber Extra. 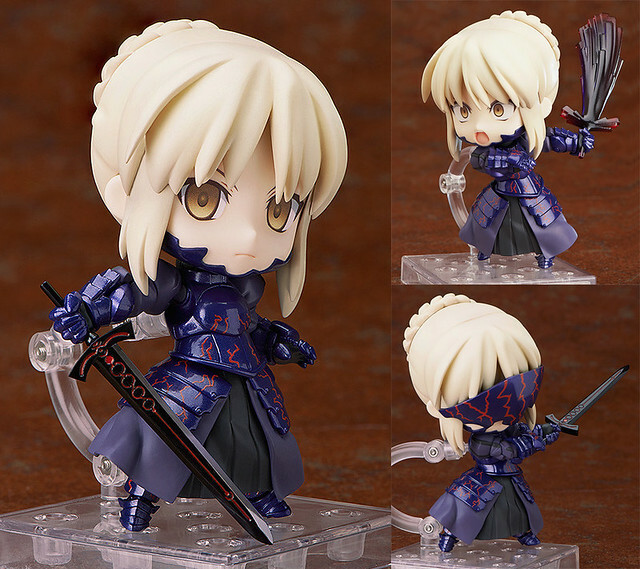 She comes with three different expressions including a smiling expression, a glaring expression and a chibi expression to recreate the Saber drawn by illustrator CHANxCO. Optional parts include a rose, as well as her sword, ‘Aestus Estus’. You can enjoy recreating a number of your favorite scenes from the series including posing her ready to fight, as well as in the famous scene from her signature move, ‘Aestus Domus Aurea’! Anyway, she will be released on November, bearing the price tag of 3800 Yen. Yep, there are triple pre-orders of Nendoroid and Petites from various TYPE-MOON series that went available earlier today. 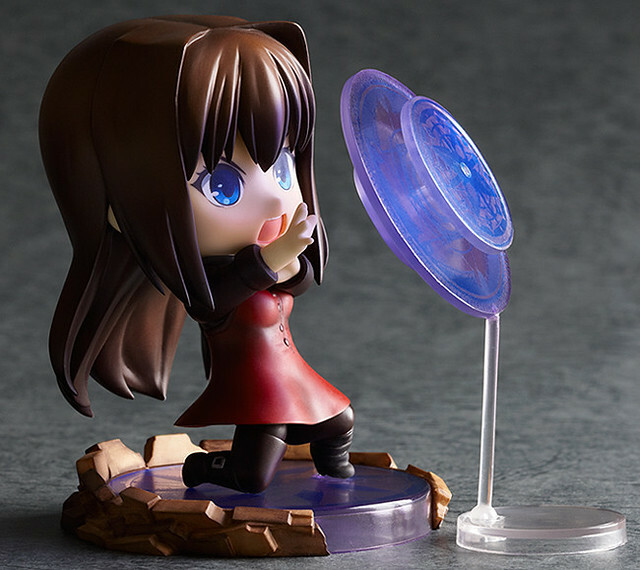 The first one is a surprising announcement of Nendoroid Aozaki Aoko from TYPE-MOON’s latest release titled Mahou Tsukai no Yoru. Actually, we have seen her previously, displayed as a prototype in TYPE-MOON Fes a few months ago. A Nendoroid of the newest witch! From famous game developer TYPE-MOON’s latest work, ‘Mahoutsukai no Yoru’ comes a Nendoroid of the game’s main character and heroine, Aoko Aozaki! She comes with three expressions including a shouting face to display her giving orders as the head of the student council, an adorable smiling face and an embarrassed chibi face! She also comes with a special pedestal, magic effect parts and a special arm to display her using her magic, allowing her to live up to her ‘Magical Cannon’ nickname. Enjoy the company of the apprentice witch whenever you like, in the pose of your choice! She is scheduled for January 2013, priced at 3500 Yen. 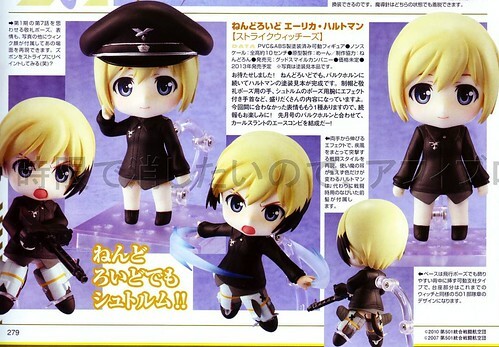 Nendoroid Erica Hartmann now appears in full-color. It looks like she will bring two expressions (smiling and angry) along with her cap, weapon, and a few effect parts as well as her Striker unit. 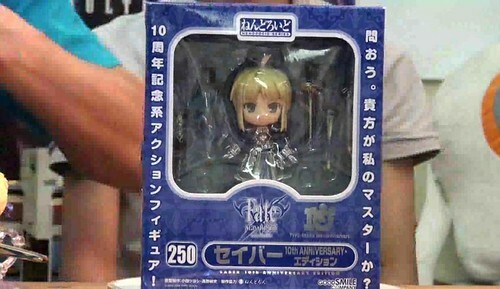 The surprising announcement on GSC’s latest Nico Nico broadcast is obviously Nendoroid Saber: 10th Anniversary Edition, and GSC did not wait long to make it official. 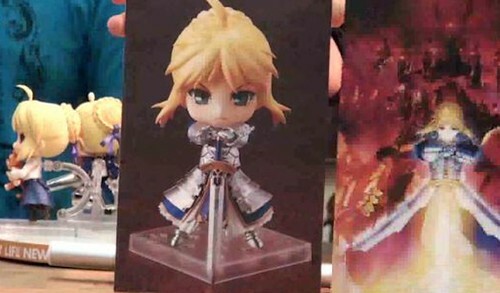 The fully posable Saber is back with shiny armor!! 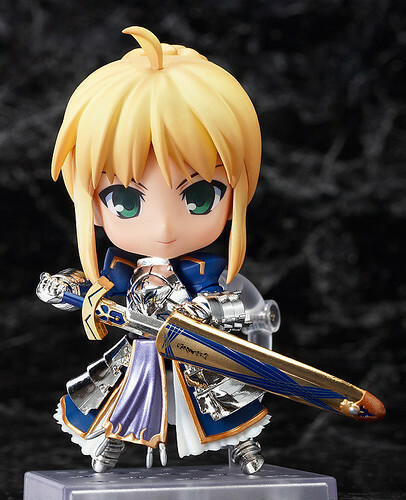 In commemoration of TYPE-MOON’s 10th anniversary, Nendoroid Saber : Super Movable Edition is coming back with a new effect applied to her armor, giving it a much shinier and more realistic appearance! She comes with three expressions: a smiling face, an angry face and even a face in mid-tantrum. But that is not all – she also comes with her swords Excalibur and Caliburn, as well as replaceable parts to recreate the sword in its “Invisible Air” form. It’s still the same adorable Nendoroid, but the Super Movable edition allows you to recreate even more of your favorite scenes from the series! … and this is the new box design, in which this Nendoroid is getting the number #250. 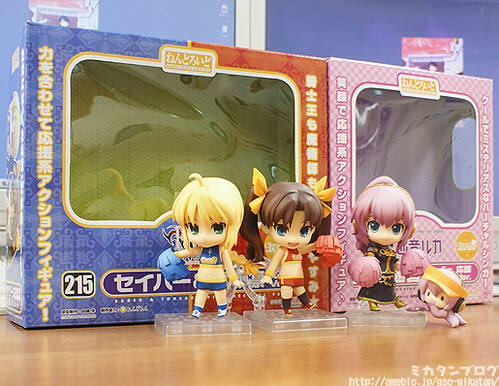 Event Sales: July 2012 release, see the TYPE-MOON Festival‘s official website for more information. Web Sales: November 2012 release, pre-order starts on July 6, 2012 (13:00 JST).